So I recently was bit by my dog. Understand that she wasn’t trying to bite me but rather kill my other dog. The bite ruptured my tendon sheath and made extension of any sort mind-numbingly painful, never mind the medial epicondylitis that appeared in response to constantly having a certain degree of flexion at the wrist. I’ve been dealing with this injury basically all summer and it has really put a hamper of my training. 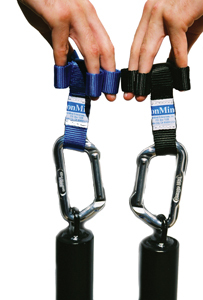 Your hands are your interface with the equipment and if you can’t grip without pain you can’t lift sufficient weight. Do not adjust your computer screen, I am in control now. While the image above shows the loops attached to loading pins, I attach them to a cable unit and do holds for time. You’re not going to need a lot of weight, I’m only using the lowest plate setting, but doing holds for 45 seconds a pop will light up the small muscles you never knew you had in your hand. In addition to the orthopedic possibilities (balancing the wrist, reducing/preventing carpal tunnel syndrome), there’s the knowledge of knowing that, after a year of using these, just about anywhere you go you’ll have the strongest finger extensors of any person there. Take the small victories where you can. You should visit this clinic… http://www.arpwaveaustin.com/ The ARP will eliminate inflammation and contracted tissue that is causing the problem. My personal site is actually theevoway.blogspot.com, though I haven’t updated in some time. The problem was a canine’s tooth rupturing the tendon sheath. The corticosteroid was used to eat the last bit of inflammation in the sheath itself. The shot was weeks ago and the inflammation is totally gone. Having said that should things crop back up I will consider all options. I was, at one point, even considering purchasing an ultrasonic massage unit for the medial epicondylitis but that’s healed up now that the hand is healed. Again, should they crop up, I’ll explore all options. Thanks for the heads up.